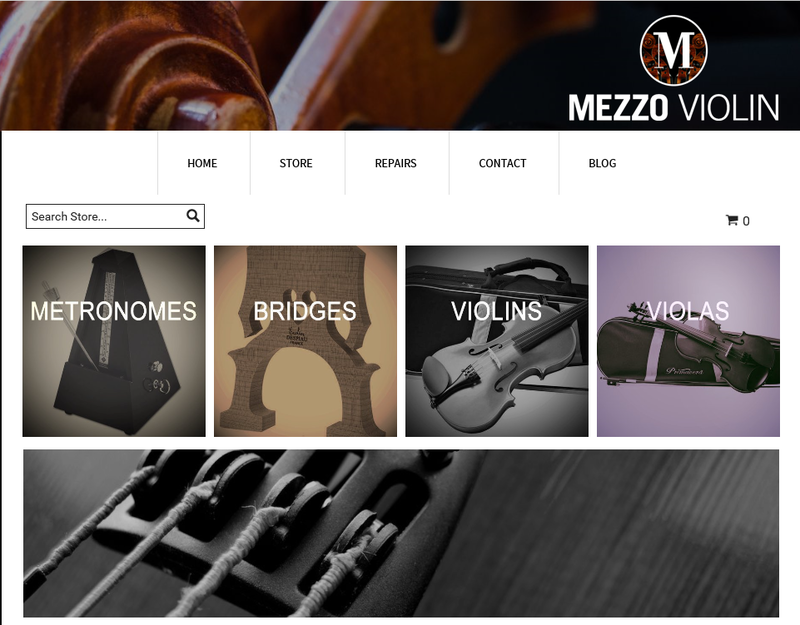 Mezzo Violin is an on-line music shop offering string instruments and a wide range of accessories. The store was founded by a group of players whose experience playing professionally and tutoring had made them want to find a store which would give impartial advice on purchasing an instrument without prioritising commercial interests. So with 30 years performing and teaching experience they have established the showroom to offer advice, consultation and on then, dealership services. 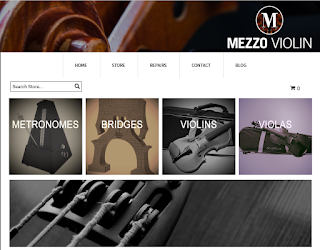 The website offers everything from violins, violas, cellos and double basses through bows and cases to a wide range of accessories. Violins range from a Heritage ‘II Cannone’ made in Beijing but inspired by the ‘II Cannone’ by Giuseppe Guarneri del Gesu, 1742, to a highly affordable Stentor Student Standard Violin Outfit. They offer a repair service, with the possibility of contacting them on-line with images of the problem and getting an expert opinion from them. 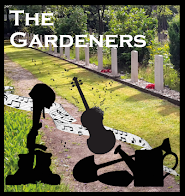 There is also a Blog with informative articles about playing and choosing an instrument. Until I came across this disc, the most I had heard of Grazyna Bacewicz's music was the occasional piece on recital discs such as Janusz Wawrowski's Sequenza disc (see my review). 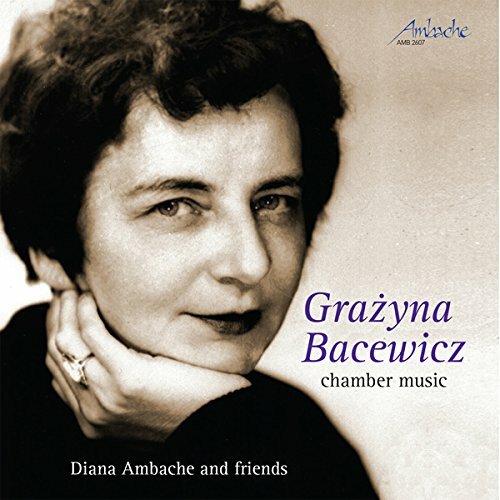 Here, on her own label, pianist Diana Ambache is joined by a wide range of friends to perform a selection of Grazyna Bacewicz's chamber music from across her career stretching from 1934 to 1965. So Diana Ambache (piano), David Juritz, Victoria Sayles, Richard Milone & Charlotte Scott (violins), Ashok Klouda, Rebecca Knight, Sarah Suckling & Morwenna Del Mar (cellos), Jeremy Polmear (oboe), Lucy Wakeford (harp) and Tristan Fry (percussion), perform Grazyna Bacewicz's Quartet for four violins, Mazovian Dance for violin and piano, Trio for oboe, violin and cello, Theme with variations for violin & piano, Quartet for four cellos, Polish dance for violin & piano, Trio for oboe, harp & percussion and Slavonic Dance for violin & piano. Grazyna Bacewicz was Poland's most acclaimed woman composers in the 20th century; her training included periods in Paris studying with Nadia Boulanger and studying violin with Carl Flesch, and she became principal violin of the Polish Radio Orchestra. Bacewicz seems to have had the ability to navigate the complex political world of post-war Poland despite never writing overtly political works. She died just before the age of 60, leaving a substantial body of work with several orchestral works, concertos and seven string quartets. 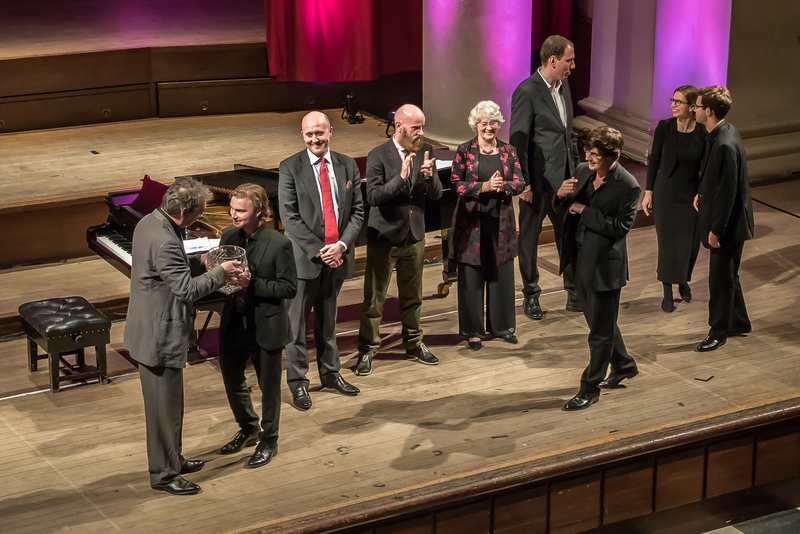 Peter Phillips' London International A Cappella Choral Competition returns to St John's Smith Square for the third competition for a week of events from Sunday 25 June 2017 culminating in the final on Saturday 1 July. Sixteen ensembles are taking part, from a remarkable range of countries: the Philippines, Colombia, the United Kingdom, Denmark, Poland, Chile, the Netherlands, Hungary, Indonesia, India, Norway. The choirs each perform before the judges in one of four heats, and each ensemble must perform a piece of Renaissance polyphony, a work by the festival's featured composer Arvo Pärt plus music of the group's own choice. As well as taking part in the heats, many of the ensembles are giving lunchtime concerts at various venues in London, and there is also the chance to hear music by the competition's featured composer Arvo Pärt with Stephen Layton conducting the Holst Singers and the Gesualdo Six in Arvo Pärt's Passio, and Tom Herring conducting Sansara in Pärt's sacred music. Both Sansara and the Gesualdo Six took part in the 2015 competition, with Sansara taking both the first prize and audience prize (see my review). Peter Phillips and The Tallis Scholars are also including music by Pärt in their concert alongside Isaac's Missa de Apostolis. There is a screening of Dorian Supin's third documentary film about Arvo Pärt, Even if I lose at the Curzon Cinema Victoria, and a photographic exhibition in the crypt at St John's Smith Square of photos by Kaupo Kikkas, Adams Lament which portray the 2011 recording sessions for Pärt's Adam's Lament. Full details from the competition website. 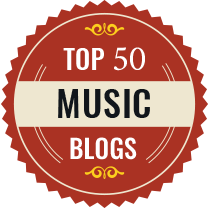 I am getting the performance archive pages up to date, so that you browse the complete list of performances we have reviewed from 2012 to 2016, with the performances from 2017 on a separate page. Nederlands Kammerkoor is 80 this year and has come up with a gloriously mad project as part of the celebrations. 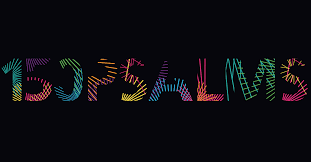 On 1 & 2 September 2017 at the Utrecht Early Music Festival the choir will be joined by The Tallis Scholars, Det Norske Solistkor, and The Choir of Trinity Wall Street, to give a sequence of concerts performing all 150 of the psalms, with music from 150 composers representing 1000 years of choral music. In all, a celebration of one of the most important literary sources for the choral music tradition. When I interviewed Peter Dijkstra (see the full interview), conductor of Nederlands Kammerkoor, he was at pains to point out the that the weekend is not an exercise in nostalgia, and that many of the psalm texts are relevant today. The references to sovereigns using power at will, the sufferings of refugees, and peoples walking around homeless clearly apply to today's world, asking the question where do I belong, what is my future, and what does my religion mean to me? And Peter calls them fantastic texts to bring alive. 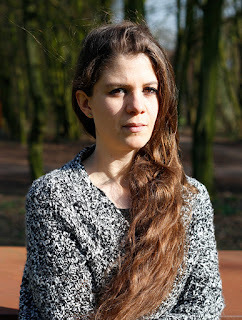 There will be a dozen concerts, with a wide range of composers Josquin to Rossi and Gretchaninov to Schumann, contemporary composers specially commissioned and premieres from American composer David Lang and Lebanese composer Zad Moultaka. But there will also be lectures, workshops, and even an interactive exhibition. Distinguished speakers including Michael Ignatieff will reflect on the psalms themes and ideas. Full details from the 150psalms website. The centre-piece of Gabrieli and Paul McCreesh's new programme A Rose Magnificat at St John's Smith Square on Thursday 8 June 2017 is a new setting of the Magnificat by Matthew Martin. Martin's A Rose Magnificat interpolates a setting of the traditional canticle with verses from the Medieval poem There is no rose which meditates, in a different way to the Biblical text, on Mary's giving birth to Jesus. McCreesh has surrounded this contemporary Magnificat with music celebrating the Virgin ranging from Robert Wylkinson's Salve Regina a 9 to Kenneth Leighton's Of a Rose. Wylkinson's piece comes from the Eton Choir Book and numerology played an important part in his thinking, the nine parts of the Salve Regina are allocated to the nine ranks of angels, whilst Leighton's sets another 15th century piece comparing the Virgin to a Rose. The concert is full of good things, Tallis's Videte miraculum and music by Howells, Taverner and Sheppard. If you can't get to St John's then fear not, the concert is also at Winchester College Chapel on 9 June 2017. Full details from the St John's Smith Square website, and, for Winchester, the TicketSource website. 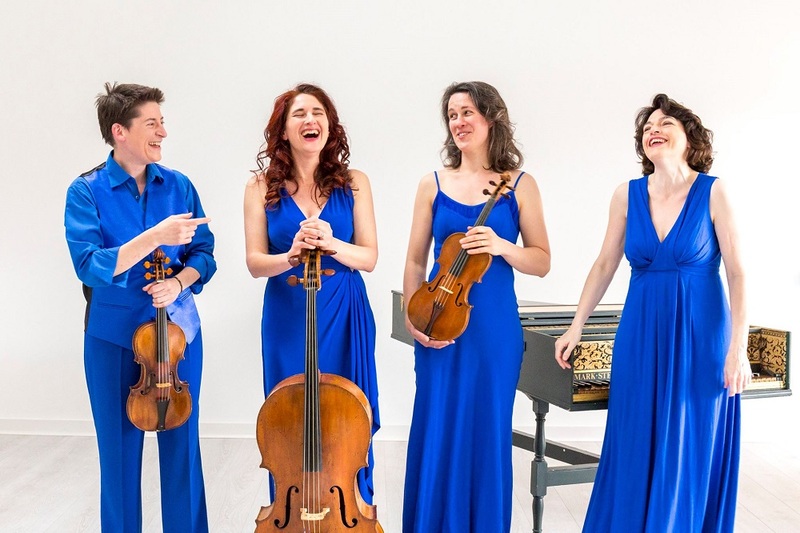 The recorder quartet Palisander (Hanna St Clair Fisher, Lydia Gosnell, Miriam Nerval, Caoimhe de Paor) has taken a rather imaginative path in programming its debut disc. 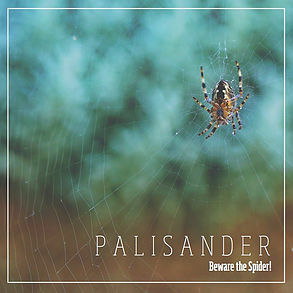 Beware the Spider!, on their own label, features music by Tarquinio Merula, Anthony Holborne, Antonio Vivaldi, Tiburtio Massanio, William Byrd, Athansius Kircher, Luzzascho Luzzaschi, and Robert Johnson, but it is recorder player Miriam Nerval's arrangements of 17th and 18th century tarantellas which give the clue to the selection. This is the ensemble's debut disc, a showcase for the player's talents, but rather than simply putting together a nice selection of pieces which show off their talents, the group explores the different ways music could thread its way through Tarantism; the theory that this hysterical disorder arising from a spider bite could be treated via music. So we have tarantellas themselves, a selection of six in all. But we also have consort music by Anthony Holborne, the composer's control of his emotive melodic writing reflecting the spider venom's control over the victims emotions. The delusions and nightmares experiences by victims are evoked by Vivaldi's programmatic flute concerto La Notte. I can think of few concert halls and theatres which could be described as a pleasure to leave. I think that Het Muziektheater in Amsterdam, with its amazing staircase, comes into this category, but most involve some sort of audience log-jam. Audience members seem to inevitably get funnelled somewhere, usually I suspect because either the venue is old and access is inevitably tricky or because economics meant that there could be no space for ideal audience access. I remember that an early design for the re-build of the Covent Garden Theatre (which eventually took place from 1997-1999) included a huge spiral staircase leading down from the amphitheatre and linking the various levels at the front of the theatre. This used the space which is now taken by the restored Floral Hall and the staircase inevitably disappeared with the decision to restore the Floral Hall. What we have now is a design which perpetuates the old theatre's warren of passages. I feel that the designers of the London Coliseum re-build seem to have got this rather better, in the way they have opened up and linked the various access routes, again in an old and historic theatre. 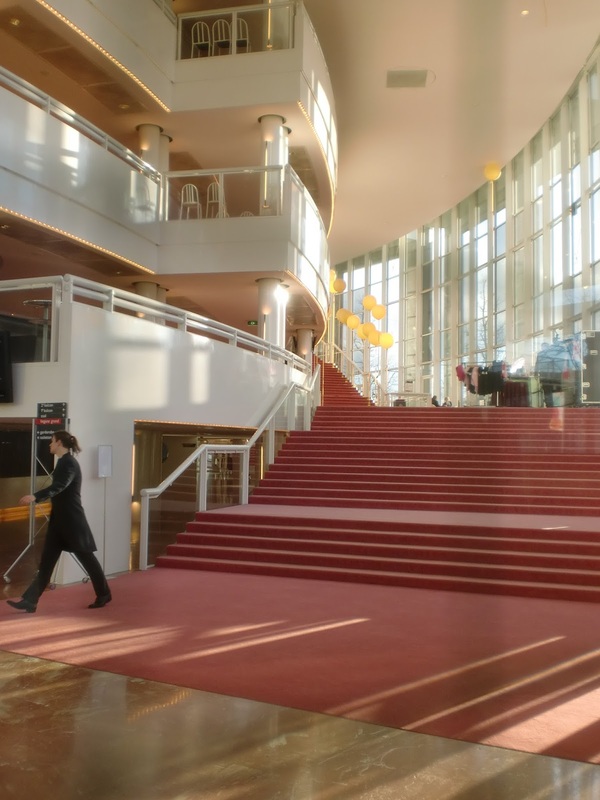 Though access does vary in different areas of the theatre, and there is usually a log-jam on the main staircase. 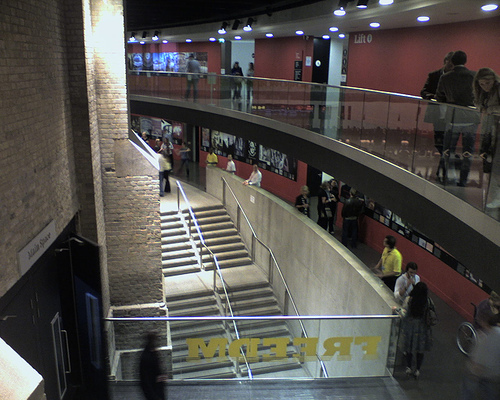 If you look at the Roundhouse with a theatre full to capacity the access routes seemed to barely cope and the staircase might look huge but its throughput has certainly certainly left much to be desired when we have attended performances. The theatre might work well with an audience of active young people, but with an audience whose members were often middle aged and elderly and needed to go carefully on the stairs, the flow rate was very low. And if you have a mobility impairment which requires you to use a lift, then leaving a theatre, even a modern one, means waiting for a long period for a lift. Another technical/economic limitation (lifts are small and expensive) which has not yet been solved. In older theatres, and when I was younger, you went into rambling theatres via the front (or the side if you were in the Gods as we usually were), but came out via the fire exits which gave you lots of different exits. Some theatres are still like this, but rather more often nowadays the fire exits are 'alarmed' (alarmed at what I might ask? Alarmed that someone might actually use them) and you can only use them in a genuine emergency. This leaves the audience forced to exit via the crowded circulation areas. I am sure that someone versed in the history and economics of theatre and concert hall design can explain why we have got to such an unsatisfactory state. But from an audience point of view, a fine performance can too often be marred by having to shuffle and queue your way out of the theatre (or push your way along the row and leave early before the applause has finished). As venues are frequently mixed use (particularly outside London), I do wonder whether designers and technical teams remember that the audience for opera is often middle-aged and elderly. Many will be on limited incomes and so will be sitting in areas like the Upper Circle which are accessed by many stairs. This all has an effect on the speed at which the theatre can be emptied, and the pleasure (or not) of the experience. It is about time that theatre and venue management and design teams (and the funders of such projects) took on board that a theatrical experience does not finish when the curtain goes down. That the ability to attract repeat audience will not depend just on what they have seen in the theatre, and what their experience of bars, restaurants and foyers was like. It will also be coloured by access issues, particularly so for opera as it is an art form which you grow into. It seems to be perpetually supported by an older audience, one which will have greater access needs. The young classical guitarist Sean Shibe has managed to make quite a name for himself, he is currently a YCAT artist, was a BBC New Generation Artist from 2012 to 2014 (the first guitarist to be admitted to the scheme) and is the only solo guitarist to have received a Borletti-Buitoni Trust Fellowship. 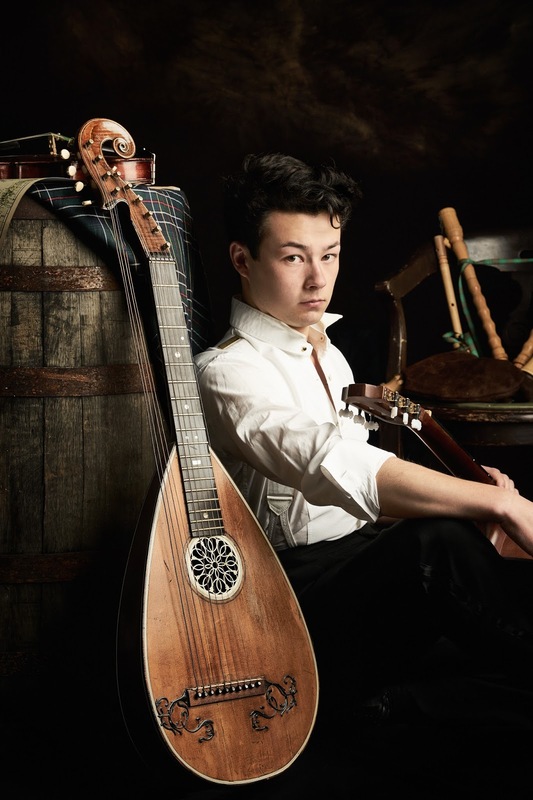 Sean's latest project softLOUD takes him into new territory, combining 16th to 18th-century Scottish music for lute and guitar with contemporary music for electric guitar inspired by his native Scotland and the USA. We met up to talk more about softLOUD, and Sean proves to be a strikingly thoughtful and passionate artist, fully aware of the dis-enfranchisement felt by many of his generation, stimulated by the challenges to the standard classical concert format, and fascinated by the contrasts between the subtle softness of the classical guitar and the awesome loudness of the electric. softLOUD pairs quiet music played on the classical guitar, mainly 16th century repertoire, with more contemporary music played on electric guitar. Sean explains that he will be playing Scots early baroque music including pieces from a number of surviving manuscripts including the Wemyss, Rowallan, Straloch, Skene and Balcarres, plus music by the 18th century Scots composer James Oswald (1710-1769), music which Sean describes as underplayed gems. More recent Scottish repertoire is represented by Peter Maxwell Davies' Farewell to Stromness, which adds a political element to the explicit Scottishness of the programme (essentially it is a farewell to the town in Orkney closest to where the Uranium mining would have occurred). Moving to electric guitar, Sean will be playing Steve Reich's Electric Counterpoint, LAD by Julia Wolfe (originally for nine bagpipes, and written after the funeral of a friend) and David Lang's Killer. He will be multi-tracking some of these pieces and when we spoke had just finished the recordings with the BBC (which will be broadcasting one of the recitals from the East Neuk Festival in late June). Sean explains that the loud part of the programme is more cathartic, as well as being elegiac and mournful, and one aspect of the programme is Sean's feeling that we can be sad about the modern-day lack of reverence for softly spoken things. 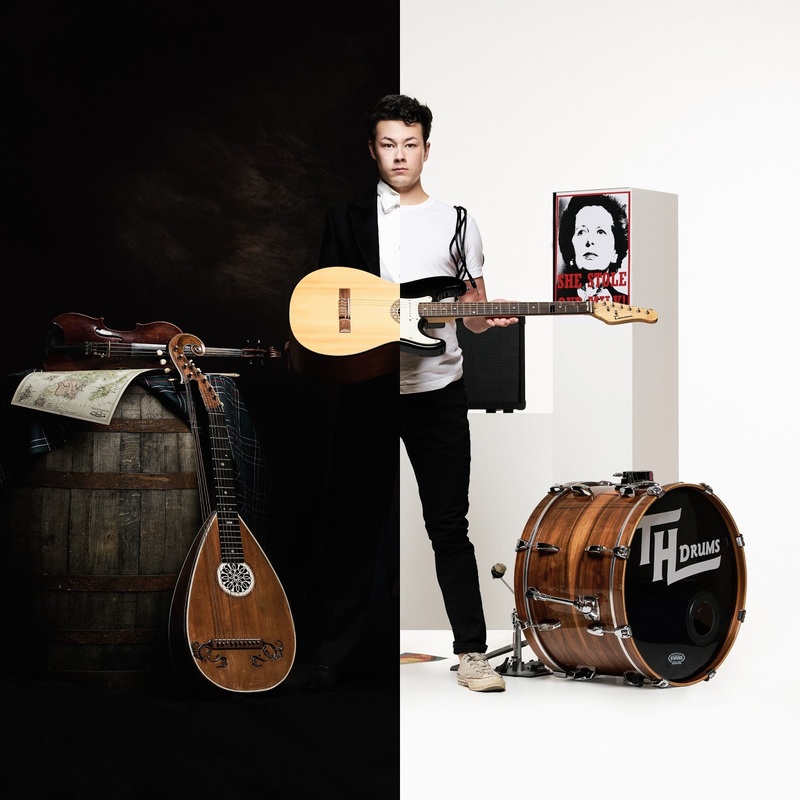 As a classical guitarist Sean will never abandon the classical recital, but he also has the urge to explore something more urgent and pointed; to try and reference the emotions that his generation (he is 25) is going through. This is particularly true of Sean as a Scot, with the referendum, Brexit and now the forthcoming election. So softLOUD is intended to represent something here and now, a millennial referencing his generations feelings at a time of disenfranchisement. The Brook Street Band returns to St John's Smith Square on Sunday 4 June 2017 with a programme entitled Handel – friends, foes and flattery which looks at some of the other lively London personalities from Handel's time, composers whose music featured more prominently in contemporary programmes than that of Handel. The concert tries to provide a picture of the lively social and political contexts which surrounded the music and includes music by Handel, the Italian-born composers Giacobbe Cervetto (an Anglo-Italian musician of Jewish descent), Francesco Geminiani (a virtuoso violinist who played violin concerti at the court of George I with Handel at the keyboard), Giovanni Bononcini (an opera composer whose popularity rivalled and outstripped that of Handel but who left London under a cloud after charges of plagiarism were proved) and Francesco Veracini (a composer and virtuoso violinist), and pieces by Handel’s direct English contemporaries Thomas Arne and William Boyce. An invigorating mix of chamber music provides contrast, with solo sonatas mixed in with trio sonatas. An illustrated pre-concert talk by the group's cellist Tatty Theo introduces the audience to the music performed, the characters who would have played it, and its social and historical context. 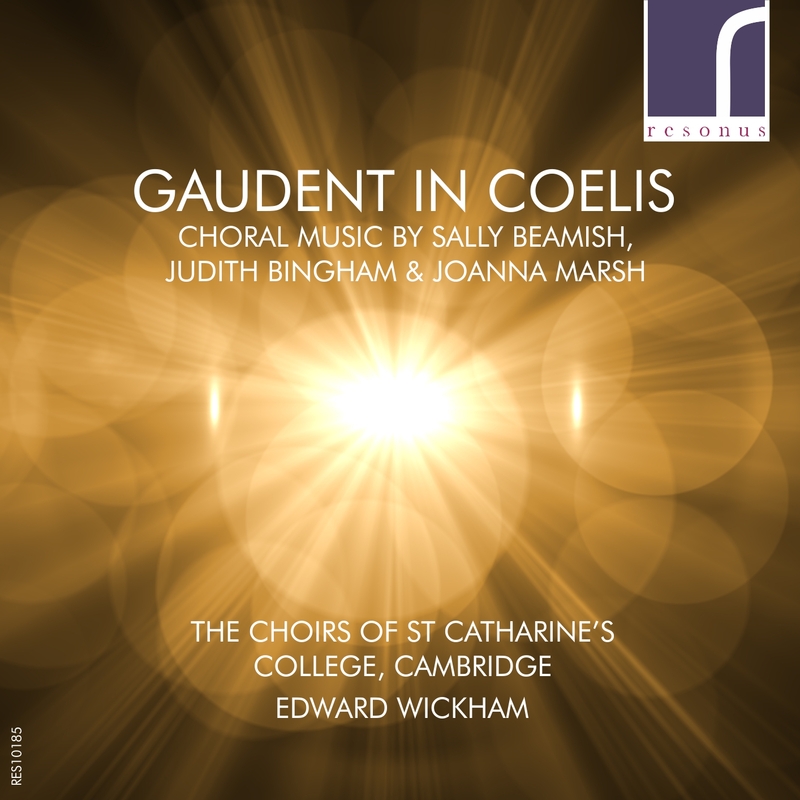 This disc on Resonus Classics features the choirs of St Catharine's College, Cambridge - St Catharine's Girls Choir with girls aged eight to 15 and St Catharine's College Choir, a mixed student choir - conducted by Edward Wickham in a programme of music by Sally Beamish, Joanna Marsh and Judith Bingham. Two of the pieces on the disc, Marsh's Missa Brevis: Collegium Sanctae Catharinae and Beamish's St Catharine's Service were written for the college's choirs. Sally Beamish's Gaudent in Coelis makes a bright and appealing opener with the young singers clearly relishing the rhythmic nature of Beamish's writing. Joanna Marsh's Thou has searched me and known me (setting a text from Psalm 139) is a lyrical poignant tribute to the composer's late mother, a piece full of lovely expressive harmonies which receives a poised performance. 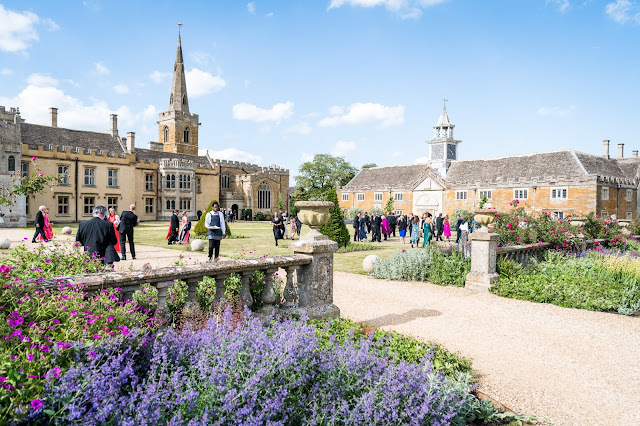 Judith Bingham's Edington Service (Magnificat and Nunc Dimittis) is so named because it was written for the 50th Edington Festival of Music in the Liturgy in 2005. Originally conceived for mixed choir and organ, this is the first recording of the composer's revised version for upper voices and organ. The Magnificat opens with the upper voices over a rocking organ pedal, creating a very striking and distinctive sound-world. Austerely expressive, the work has some rather Britten-esque moments, whilst the haunting Nunc Dimittis is full of lovely textures. The Cadogan Hall's Zurich International Orchestra Series returns for the 11th series in 2017/18 with 16 concerts performed by 14 orchestras, including the Mariinsky Orchestra with Valery Gergiev, the SWR Symphony Orchestra Stuttgart with Sir Roger Norrington, the Dresden Philharmonic with Michael Sanderling and the Bruckner Orchestra Linz. The series opens on 6 October 2017 with Ivor Bolton conducting the Basel Symphony Orchestra in a programme including Busoni's Lustspiel. Soloists during the season include a fine array of pianists with Peter Donohoe in Rachmaninov's Piano Concerto No. 4 with the St Petersburg Symphony Orchestra, conductor Alexander Dmitriev, Stephen Hough in Mendelssohn's Piano Concerto No. 1 with the Basel Chamber Orchestra, conductor Heinz Holliger, Lars Vogt in Beethoven's Piano Concerto No. 2 with Andrew Manze and the NDR Symphony Orchestra, Francesco Piemontesi in Beethoven's Piano Concerto No. 3 with the SWR Symphony Orchestra Stuttgart and Sir Roger Norrington, and John Lill in Rachmaninov's Piano Concerto No. 2 with Rumon Gamba and the Wurth Philharmonic Orchestra. The Czech National Symphony Orchestra and Petr Altricher perform with two pianists, Barry Douglas in Beethoven's Piano Concerto No. 5 and Pavel Kolesnikov in Beethoven's Piano Concerto No. 4. Kolesnikov returns with the Flanders Symphony Orchestra and conductor Jan Latham Koenig to perform Beethoven's Piano Concerto No. 1. Concerts from the Brussels Philharmonic and conductor Stephane Deneve feature two violinists, Nikolaj Zneider in Bruch's Violin Concerto and James Ehnes in Bernstein's Serenade. Full details from the Cadogan Hall website (PDF). 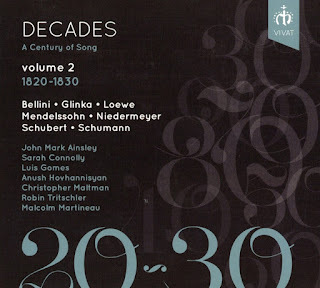 This is the second in Malcolm Martineau's series on Vivat, A Century of Song, exploring songs decade by decade (see my review of volume one). This disc looks at the period 1820 to 1830 so we have a selection of Schubert's final songs, a pair of early songs by Robert Schumann and Felix Mendelssohn, plus songs by Glinka, Louis Niedermeyer, Carl Loewe and Vincenzo Bellini. As with the first volume, the songs are performed by a wide selection of artists, Christopher Maltman, John Mark Ainsley, Anush Hovhannisyan, Luis Gomes and Robin Tritschler. The interesting problem with this concept is of course the difficulty in selecting songs, for this decade there is the need to do justice to the towering masterpieces of Schubert whilst looking at what was going on elsewhere. French song is largely ignored, with just Louis Niedermeyer's single song. Susan Youens' booklet article talks about Niedermeyer breaking the mould of the old-fashioned strophic romance, though we are not treated to a sample of this type of song, whereas Bellini's ariettes are included. Here Youens says 'if they are trifles, they are exceedingly elegant ones', but if Bellini's trifles can be included why not others. I was also intrigued that none of Louis Spohr's songs have made it to the disc, and where on earth is the Berlioz? 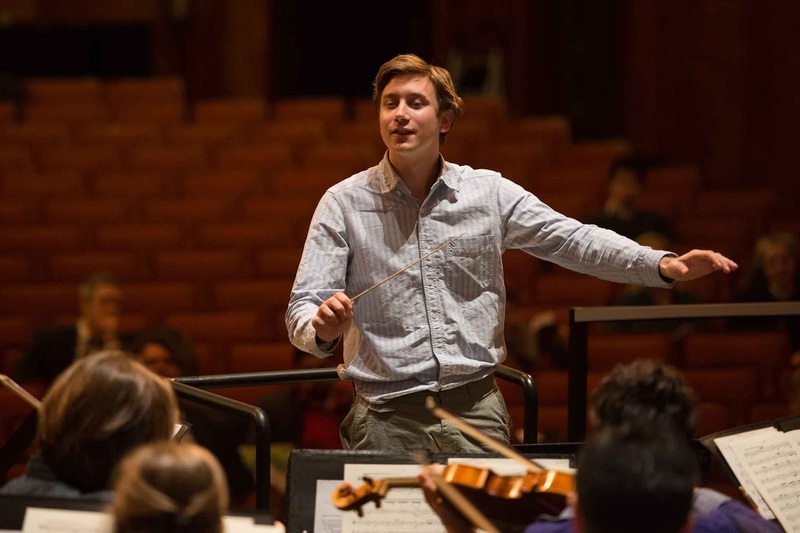 The young British conductor George Jackson makes his Hamburg State Opera debut conducting a new opera, Immer weiter, by two composers. 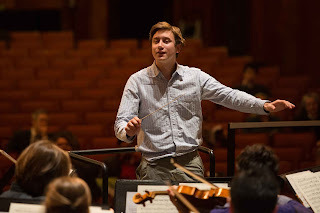 On 7 July 2017, the young British conductor George Jackson makes his debut at Hamburg State Opera conducting the premiere of a new opera, Immer Weiter a new collaboration between the two young composers, Jesse Broekman (Dutch) and Irene Galindo Quero (Spanish) with each taking responsibility for part of the opera. But the whole piece is the result of a wider collaboration as 15 cultural creators from the fields of composition, stage direction, set design, dramaturgy, conducting and culture management came together to create a new work as part of the Deutsche Bank Foundation's Academy Musical Theatre Today („Akademie Musiktheater heute“ der Deutsche Bank Stiftung). I talked to George via Skype from Wiesbaden to find out more about the opera. He admitted that there was a danger when using two composers for a single piece, but he felt that though the two composers are different stylistically their music fits well and the piece has no major danger points. The work started on the opera in 2014 when the Deutsche Bank Foundation selected the 15 young creators, with two or three from each discipline and they engaged in a two and a half year process of collaboration. George was involved in all of the planning, the discussions about what was to go into the opera, what was to go into the text. But his involvement ramped up from the end of April this year when the score was delivered and he goes into rehearsals at the end of this month. The work uses seven soloists (one soprano, one mezzo-soprano, two tenors, one baritone and one bass) with a reasonable size chamber ensemble (accordion, violin, two violas cello, flute, clarinet and trombone, plus extensive percussion). The text has taken five different poems which are put together in a series of fragments, George described it as lots of people doing different things but coming together ultimately. The title come from Lev Rubinstein's collection, Immer weiter und weiter, and Rubinstein's poems are used alongside those of the Slovenian poet Aleš Šteger. The texts explore the themes of dystopia, the relationship of the individual to society and the sense of anonymity. Rubinstein's short texts were originally written on small library cards, often beginning 'Someone ..', and this sort of anonymity is a feature of the way the composers have set the text, so there are no character names. 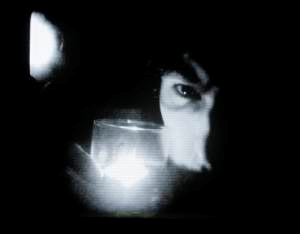 George feels that the music shows great influences from Helmut Lachenmann and from musique concrete, often the instruments are manipulated rather than played, creating a feeling of dystopia via an atmospheric background which evokes electronic music. The players will be from the Hamburg Philharmonic Orchestra (which plays at Hamburg State Opera), and whilst George will be going into detail with the performers he is aware that he will also need to be aware of the overall soundworld of the piece. This intriguing new opera which seems to reflect concerns with a dystopian vision of society opens at Hamburg State Opera on 7 July 2017 in the opera's smaller studio theatre, Opera Stabile, and there are a number of performances. (Further details from the Hamburg State Opera website). When I last saw George conducting it was in May 2016 at one of Trinity Laban's Side by Side events where the Trinity Laban Symphony Orchestra performed alongside members of Welsh National Opera Orchestra in a Elgar's Symphony No. 1 (see my article). When we spoke for this article he was just back from Romania where he was conducting Elgar's Enigma Variations with the Transylvanian Philharmonic (based in Cluj) and this was very much like a new piece for them, so George felt he was responsible for selling the work to both the audience and to the orchestra. 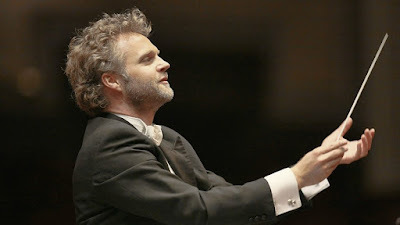 He has a regular relationship with the Haydn Orchestra of Bolzano and Trento and will be opening the Bolzano Festival in this Summer with the orchestra in a programme which includes Mendelssohn's Scottish Symphony. From the Autumn George has a new position, Studienleiter and Assistant Conductor at the Theater an der Wien in Vienna, where his first assignment will be working on Robert Carsen's new production of Berg's Wozzeck (which opens on 15 October 2017, conducted by Leo Hussain with Florian Boesch in the title role, see the theatre's website). Ballroom, Lee Plaza Hotel. Part of The Ruins of Detroit by Yves Marchand and Romain Meffre, 2006. With kind permission from the artists and assistance from Tristan Hoare Gallery. 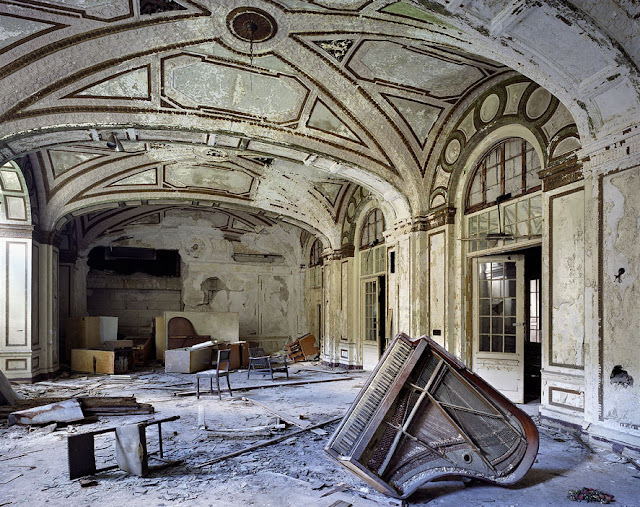 The Ruins of Detroit is a series of photographs by Yves Marchand & Romain Meffre depicting the ruined grandeur of the architecture of Detroit, USA, reflecting the rise and fall of the industrial revolution in America which both created the city of Detroit and destroyed it. These photographs inspired the composer Gavin Higgins (born 1983) to write a piano trio, each movement having a title derived from one of the images 'I. Ballroom, Lee Plaza Hotel', 'II. Car, Michigan Theatre', 'III. Piano, St Albertus School'. The trio was short-listed in the 2015 British Composer Awards. On 1 June 2017, Gavin Higgins The Ruins of Detroit forms part of the Minerva Piano Trio's lunchtime concert at St John's Smith Square, alongside works by Shostakovich (1906-1975), and Beethoven (1770-1827). The Minerva Piano Trio (Annie Yim, Michal Cwizewicz, Richard Birchall) is currently one of the Young Artists at St John's Smith Square, and the concert is part of the trio's year-long residency. On this disc from Warner Classics, the young Polish composer Tomasz Opałka's music emerges with vigour and energy, immediately commanding attention. The disc contains four of Opalka's recent orchestral works, Collisions of the matter (2012) and Symphony No. 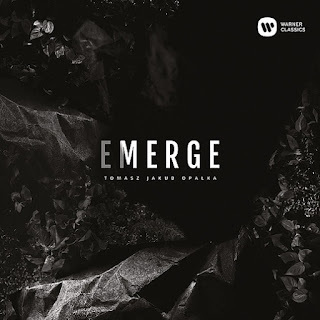 2- Emerge (2014) performed by the Polish Sinfonia Iuventus Orchestra, conducted by Krzysztof Slowinski, D.N.A. Bass Clarinet Concerto (2012) performed by Jadwiga Czarkowska (bass clarinet), Warsaw Philharmonic Artists 'Chamber Orchestra of the Chain X Festival', conductor Wojciech Michniewski, and Quadra (2007) performed by Polish Radio Symphony Orchestra, conductor Lukasz Borowicz. 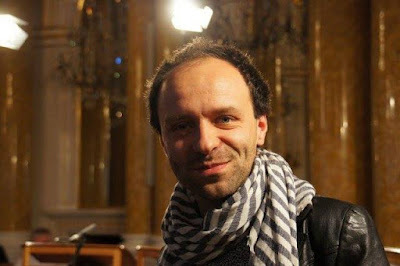 Opałka (born 1983) studied composition under prof. Krzysztof Baculewski at the Fryderyk Chopin Music University in Warsaw, after graduating in 2013 he further developed his skills in composition and orchestration in Los Angeles, working with leading film composers including Christopher Young and Marco Beltrami. Since 2012 he has divided his activity between concert and film music, between Warsaw and Los Angeles. The music on this disc often has a complex theoretical underpinning (that of the bass clarinet concerto uses Lutoslawski's chain techniques and DNA sequencing), but what comes over to the listener is the immediacy and vibrant energy of the music. That Opalka has worked in film music might be apparent from some of the techniques he uses, but he certainly does not shy away from complexity. A first look at the CD cover art-work for Quickening, the forthcoming CD of my songs on Navona Records (coming out in the Autumn). 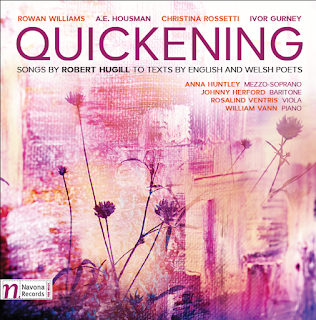 The disc features my settings of poems by Rowan Williams, A.E. 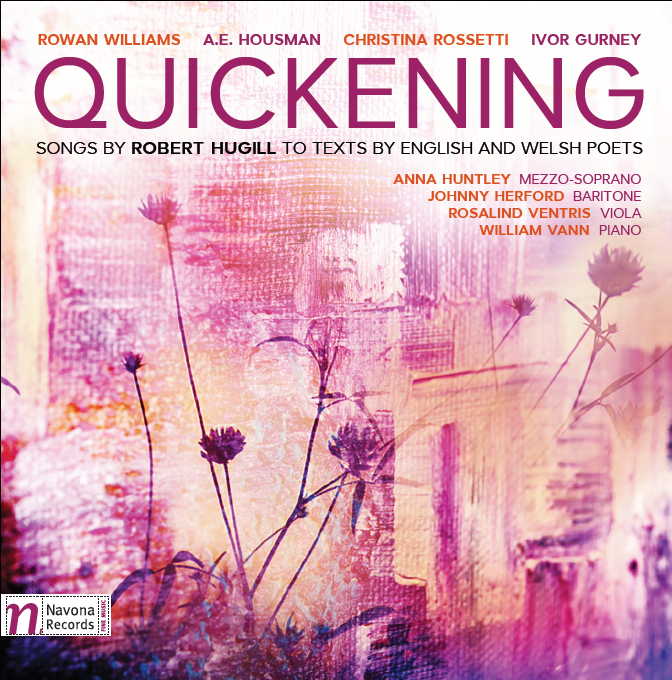 Housman, Ivor Gurney and Christina Rosetti, performed by Anna Huntley (mezzo-soprano), Johnny Herford (baritone), Rosalind Ventris (viola) and William Vann (piano). During the 2017/18 season the BBC National Orchestra of Wales celebrates its 90th anniversary in April 2018, and the orchestra is also joining with arts organisations across Wales for Russia 17, a series marking the centenary of the 1917 Russian Revolution. Principal conductor Thomas Søndergård opens the season with Mosolov’s Iron Foundry, Shostakovich’s Symphony No. 12 (The Year 1917) and closes it with Shostakovich's Symphony No. 4. Søndergård's other concerts with the orchestra include Sibelius's Symphony No. 5 and Dvořák’s The Golden Spinning Wheel. The orchestra's composer in association, Huw Watkins, curates two concerts at BBC Hoddinott Hall this season, exploring the music that shaped him both as a composer and a performer. Conducted by Martyn Brabbins, Huw joins the orchestra for Britten’s Piano Concerto plus Tippett’s Suite for the Birthday of Prince Charles and Bartok’s Concerto for Orchestra. And the orchestra is directed by Ryan Wigglesworth in music by living composers selected by Huw, including John Woolrich’s Oboe concerto which is performed by Nick Daniel. Two concerts feature music by former composers in association, Michael Berkeley, Simon Holt and B Tommy Andersson, and former composers in residence, Guto Puw and Mark Bowden. The orchestra will be collaborating with the National Dance Company Wales for a performance of P.A.R.A.D.E at Wales Millennium Centre and Pontio, Bangor with Erik Satie’s pioneering score for a reimagined version of the Ballets Russes’ Parade which features a typewriter, foghorn and mop! The performance begins with outdoor artistry before the audience is taken through to the stage; dancers, musicians, artists and a renegade aerial robot unite for a revolutionary dance experience. BBC NOW presents Bernstein's glittering music for the stage at Brangwyn Hall, Swansea as part of the celebrations for the composer’s centenary, with clarinettist Annelien Van Wauwe led by Eric Stern. Full details from the orchestra's website. Harry Bicket and the English Concert's performance of Handel's Ariodante at the Barbican Hall on Tuesday 16 May 2017 was part of a tour intended to showcase Joyce DiDonato in the title role, in the event DiDonato only sang in the American leg of the tour and her place was taken in the European concerts by Alice Coote, joined by a strong line-up of soloists including Christiane Karg, Mary Bevan (replacing Joelle Harvey), Sonia Prina, David Portillo, Matthew Brook and Bradley Smith. 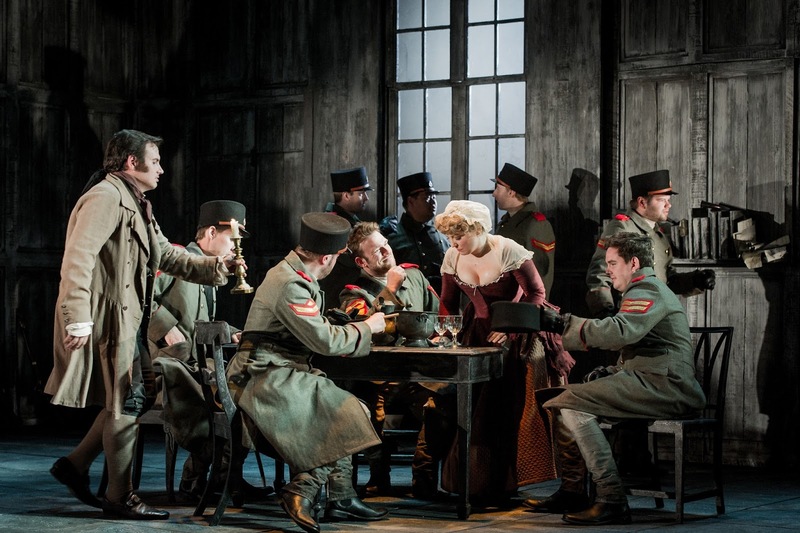 Ariodante is the Handel opera that has a happy ending a third of the way through. 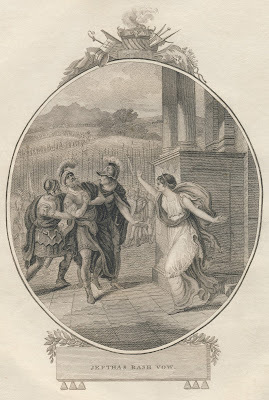 The hero, Ariodante, gets the girl (Ginevra) by rescuing her from the baddy Pollinesso. The baddy gets sidelined as the other girl (Dalinda) has a better offer from the nice tenor. 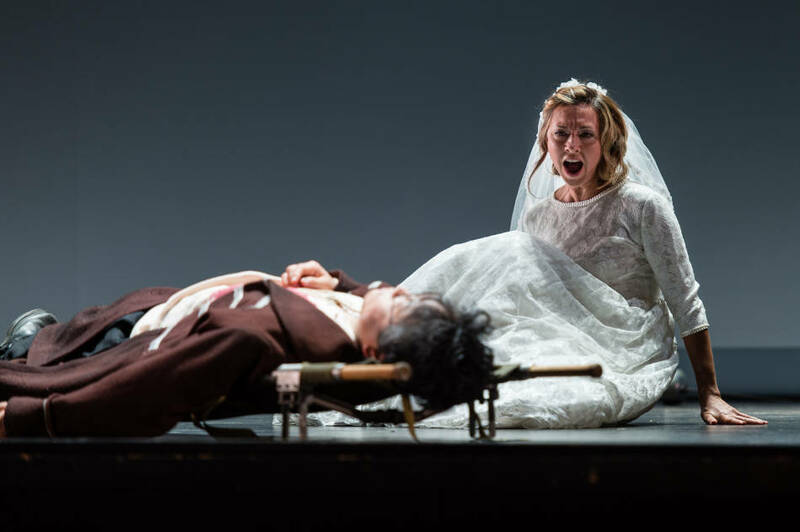 Act Two is the dark centre, when the villain tricks the other girl into dressing up as Ariodante’s beloved and the hero sings one of the most heartbreaking arias in opera seria: ‘Scherza infida’. Then in Act Three the hero gets the girl back, the tenor gets the other girl, the baddy dies and the King throws a party. This Barbican concert was not billed as a semi-staged performance, though there were ons and offs, the singers referring occasionally to the score but otherwise using the large empty paces either side of the band on the Barbican Hall platform. No director was credited in the programme. Apart from the two mezzos, Sonia Prina and Alice Coote, who seemed to have brought their own production with them, it was a fairly clear, simple performance in line with the classification of the opera as ‘German pastoral’. Musically it was mostly wonderful. This side by side event at the Wigmore Hall at lunch-time on Friday 19 May 2017, saw seven singers (Isabelle Peters, Eline Vandenheede, Lauren Lodge-Campbell, Clara Kanter, Collin Shay, Robin Horgan, Benson Wilson) and six pianists (Krzysztof Moskalewicz, Ljubica Stojanovic, Florent Mourier, Mandee Madrid-Sikich, Rebecca Cohen, Krystal Tunnicliffe) from the Guildhall School of Music and Drama alongside mezzo-soprano Anna Huntley and pianist Alisdair Hogarth. They performed three pieces which required a degree of musical teamwork, Robert Schumann's Spanische Liebeslieder Op.138, for soprano, mezzo-soprano, tenor, bass and piano duet, Cheryl Frances-Hoad's Invoke Now the Angels, for soprano, mezzo-soprano, counter-tenor and piano and Brahms Neue Liebeslieder Walzer Op.65, for soprano, mezzo-soprano, tenor, bass and piano duet. 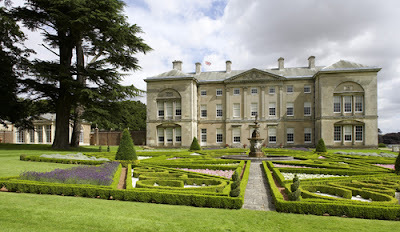 Each work was performed by a different group of performers with Anna Huntley singing alongside two students in the Cheryl Frances-Hoad, and Alisdair Hogarth being part of a relay of five pianists who played the Brahms. 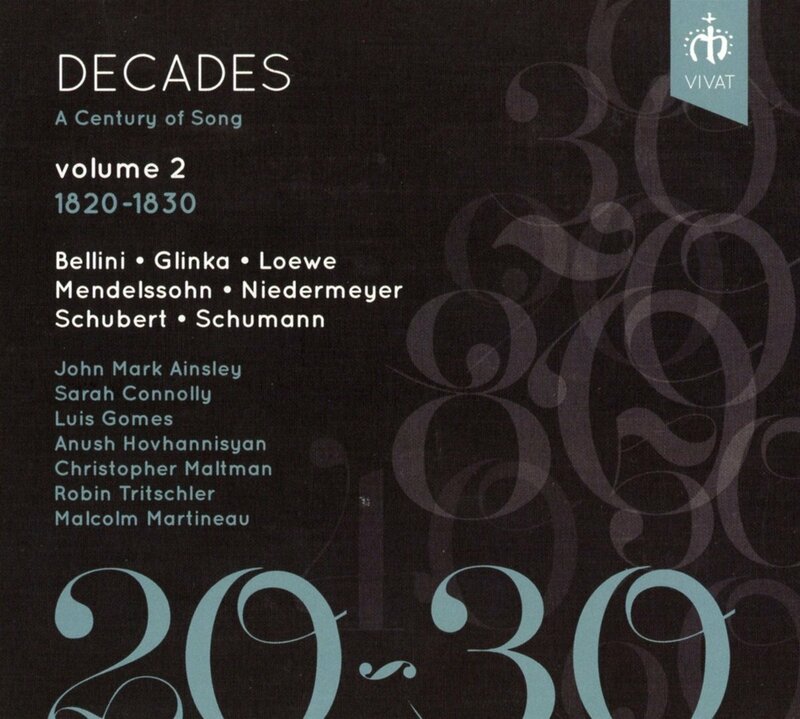 Robert Schumann's Spanische Liebeslieder (written in 1849) consists of piano vorspiel and intermezzo, and eight vocal items setting German versions of Spanish poems with a solo for each of the singers, a female duet, a male duet and a final ensemble. An event like this is an important for students to develop their technique performing lieder in front of an audience. This is a process where the performance is almost more important than the voice, and one of the fascinating things about the concert was seeing the way that the various singers were at different points on their journey towards becoming a finished artist. All four singers in the Schumann were engaging and fully taking control of the stage as they performed. The two women blended beautifully in their duet, and emoted finely but were rather discreet and perhaps a bit careful. Definitely nice girls when they could have done with being a bit naughtier, whereas the two men by contrast took vivid control of the stage. All accompanied with characterful elan by the two pianists. Cheryl Frances-Hoad wrote Invoke Now the Angels in 2013 for the Prince Consort specifically to be performed between Britten's Canticles. Frances-Hoad asked the poet Kei Miller to provide the striking text and the resulting work for soprano, mezzo-soprano, counter-tenor and piano was powerfully strong with the three soloists having sections ensemble as well as solo moments. It is a terrific piece, though sat oddly between the lighter Schumann and Brahms, and received a powerful performance from Anna Huntley and the three students (soprano, counter-tenor and pianist). Brahms' Neue Liebeslieder-Walzer Op.65 were written in 1874, a sequence of fifteen songs for soprano, mezzo-soprano, tenor, bass and piano duet, mixing solos, duets and ensembles. The mezzo-soprano, tenor and bass from the Schumann were joined by a new soprano, and accompanied by a relay of five pianists. Whether it was the change in soprano, or the fact that the singers were more relaxed, but you felt that the singers really took control of the stage and projected, the performance was beautifully balanced and very engaging. All four singers were vibrant and fully engaged, well supported by the pianists, giving us some delightfully characterful moments. Baroque Remix is a new classical club night launching at the arts venue, IKLECTIK, Old Paradise Yard SE1 7LG, on June 3. The night will feature baroque DJs alongside live instrumental performances from Carla Rees (baroque flute) and Liam Byrne (viola da gamba). Combining music from across the centuries including drum loops, hip hop and R&B samples, the evening will reimagine the music of the 17th and 18th centuries. Live sets will showcase the diversity and beauty of the historic instruments, presenting a mix of old music and new. 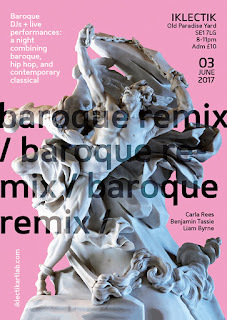 Previously performed at the V&A (part of a museum late) and Royal Palaces (for 'Queen James' at Banqueting House), Baroque Remix will be the first full-scale night of its kind, sampling Lauryn Hill alongside William Byrd, or 2Pac with Pergolesi, all in the informal setting of IKLECTIK's bar and garden. Full details from the event's website. The production features music by Kurt Weill and Hanns Eisler, with songs from Das Berliner Requiem, Seven Deadly Sins, Die Dreigroschen Oper, Schweik In The 2nd World War and Mahagonny. Smock Alley Theatre was originally the second theatre to be built in Dublin, in the 17th century, but from the late-18th century the theatre closed and it subsequently became at church, returning to life as a theatre in 2012. The theatre was operating during Handel's 1741/42 visit to Dublin, but he did not perform there. Full details from the Smock Alley Theatre website. 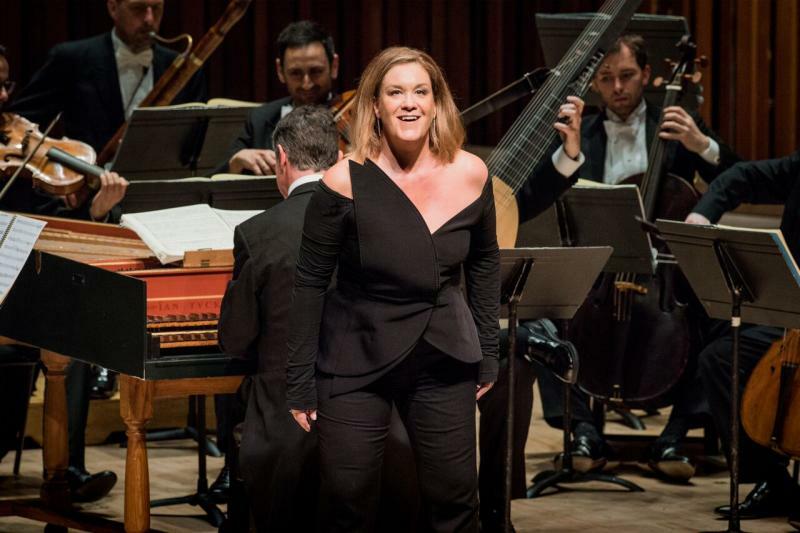 The London Festival of Baroque Music concluded at St John's Smith Square on Saturday 20 May 2017 with a performance of Handel's oratorio Jephtha. Stephen Layton conducted the Holst Singers and the Academy of Ancient Music with Nick Pritchard as Jephtha, Helen Charlston as Storgè, Matthew Brook as Zebul, James Hall as Hamor, Mary Bevan as Iphis and Rowan Pierce as the Angel. Jephtha is regarded as Handel's final oratorio. It was written whilst he was suffering badly with his eyesight and premiered in 1752, after which Handel only managed to produce The Triumph of Truth and Time which was effectively an English re-write of his early Italian oratorio, produced with the aid of Joseph Smith as amanuensis. Jephtha has almost become main-stream now, there have been staged performances at the Buxton Festival, at English National Opera and at Welsh National Opera, and it was performed a few years ago at the London Handel Festival, with tenors such as James Gilchrist, Mark Padmore, John Mark Ainsley and Robert Murray essaying the title role. So it is easy to forget quite how 'at the edge' the piece was when first written. The title role was written for the great tenor John Beard, the final celebration of a talent which had inspired Handel to create a series of striking tenor roles, elevating the tenor voice in a way that was practically unheard of in the earlier Baroque period. The libretto explores some dark places, librettist Thomas Morrell incorporated elements of Greek drama into his re-working of the biblical story. Whilst Morrell was concerned to point a moral, Handel's music re-focuses the drama making it more human and it is hard not to identify the intensity of Jephtha's predicament with Handel's own struggles with his sight. John Beard clearly had quite a robust, yet flexible voice, his roles for Handel stretch from the lyrical in L'Allegro right through do the dramatic tour-de-force of the title role in Samson. The young tenor Nick Pritchard is very much a lyric tenor and his voice does not (yet) have either the dramatic heft or the spinto blade to either dominate or cut through the orchestra and he sensibly offered a lyric account of the role. There was something doubly valedictory about this performance by the European Union Baroque Orchestra (EUBO) at the London Festival of Baroque Music at St John's Smith Square on Friday 19 May 2017. Not only was it the final performance of the orchestra with this particular line up, before the current players return home and a new group assembles, but it was the last performance before EUBO moves its base of operations from the UK to Belgium (as an EU funded organisation the group needs to be based in an EU country). The ensemble was directed from the harpsichord by Lars Ulrik Mortensen, with Bojan Cicic as concertmaster, in a programme of Bach and Handel with soprano Maria Keohane; Handel's Concerto grosso in D minor Op.6 no.10, cantata Tu fedel? Tu costante? HWV171a, Passacaille in G minor (from the Trio Sonata Op.5 No.4) and 'Ombre pallide' from Alcina, and Bach's Harpsichord concerto in a major BWV 1055 and cantata Weichet nur, betrübte Schatten BWV 202 (Wedding Cantata). We started with Handel's concerto grosso; the stylised Ouverture, with bows really digging in, led to an Allegro which danced with a swing. The slow movement was graceful, followed by a pair of beautifully characterised Allegros, and a final Allegro moderato which had moments of robust enjoyment. You could imagine a grander performance, but not one better characterised. Lars Ulrik Mortensen encouraged his young players to really bring out the individual characteristics of the different sections of the music, and it helped that they were clearly enjoying themselves too. The version of Handel's cantata we heard was not the familiar one, it starts the same but then wanders off; it comes from a manuscript owned by Ton Koopman who realised it differed from the familiar version written in 1707 and this version may even date from before Handel's trip to Italy. This disc is the first fruits from the Heidenheim Opera Festival, though the CD booklet does not make that particularly obvious. Verdi's Oberto was staged at the 2016 festival (based in Heidenheim an der Brenz in Baden-Württemberg in Southern German) and this recording was made in Heidenheim shortly afterwards. Released on the Coviello Classics label it features Marcus Bosch conducting the Cappella Aquileia and Czech Philharmonic Choir Brno. Bosch is the artistic director of the Heidenheim Opera Festival and Cappella Aquileia is the resident orchestra. The cast features the Korean bass Woong-Jo Choi as Oberto, the Russian soprano Anna Princeva as Leonora, Czech mezzo-soprano Katerina Hebelkova as Cuniza, Romanian tenor Adrian Dumitru as Riccardo and the Slovak mezzo-soprano Daniela Banasova as Imelda. 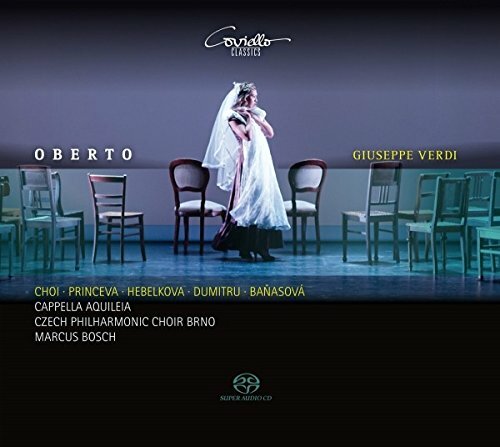 Oberto was Verdi's first opera. It was sufficient a success when first produced at La Scala Milan in 1839 for the impresario to commission two further operas from Verdi. It went on to have further performances in Italy in the early 1840s but it has been overshadowed by Verdi's subsequent operas (by 1844 he had produced, Un giorno di regno, I Lombardi, Nabucco and Ernani). The highly abbreviated libretto provides Verdi with some strong scenes yet is not high on logic. When I saw it performed by Opera North in the 1994/95 season the director (John Tomlinson) commented that it made most sense if you thought of it as the second two acts of a three act opera. The plot involves a background of warring politics (insufficiently sketched in), and a tenor hero Riccardo (Adrian Dimitru) who is about to marry one woman, Cuniza (Katerina Hebelkova) whilst having been betrothed to another, Leonora (Anna Princeva) whose father Oberto (Woong-Jo Choi) is passionate in his support of his daughter's rights. Perhaps the work's strongest scene is the wonderful duet for father and daughter, Oberto and Leonora, finding each other again after a long absence.